What have you blogged for me lately? I can’t believe that it was February 2014 when I first blogged about my Care Labels For Humans idea. In brief, the Care Labels are applied to customisable badge which serves to communicate how the wearer wishes to be treated. Our clothes have care labels because our clothes can’t tell us exactly how they need to be treated to be kept in good condition. Care Labels For Humans are being developed to allow people to communicate their needs without the having to be explicit about their emotional state. So why have I returned to the Care Labels project after such a long break? Back in 2014, I had thought about using elements of the Rubik’s Cube or Lego bricks to build the customisable badge. I had also generated a bunch of wearable item ideas. I also explored how the wearable could become a connected device, sending Care Label signatures to a mobile phone. There was just so much potential for Care Labels For Humans, and I became convinced I needed to get started with a commercial-standard product. Work ground to a halt. This summer, I was fortunate enough to spend a week in Italy on a retreat called F**k It: Do What You Love. Through a series of workshops I began to uncover some of the things that I’d forgotten I loved doing like writing this blog and creating wellbeing tools. At the end of the week I pledged to develop the Care Labels For Humans concept. So, back in September 2017, I’m committed to prototyping. I also have relatively little time to prepare a prototype in time for Geek Mental Help Week. Lego brick badges rapidly became replaced with cardboard while custom elements became stickers that I would print myself. 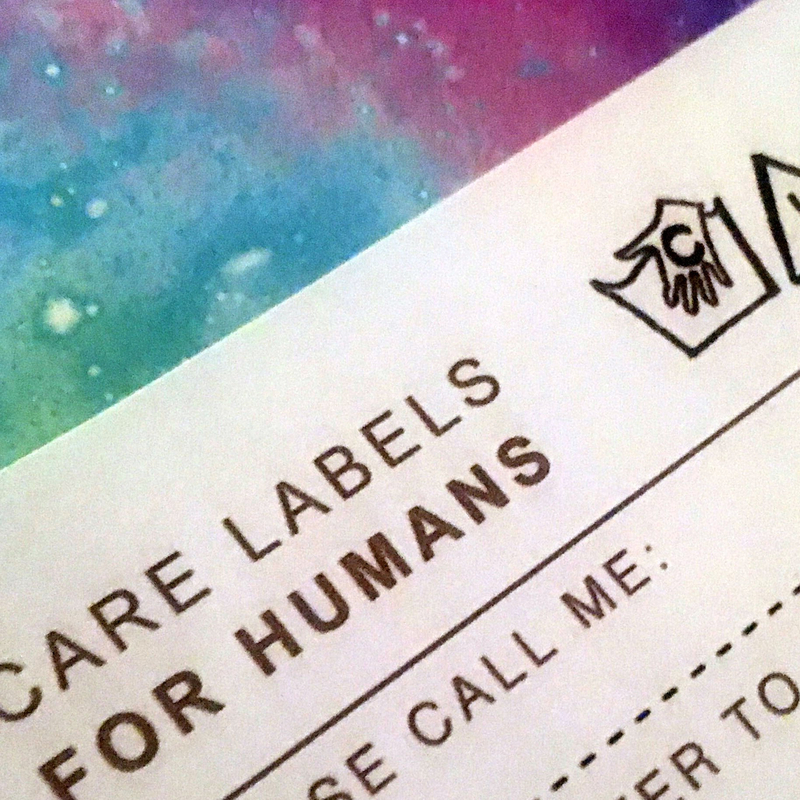 Care Labels For Humans was back in business! The badge back for Care Labels custom stickers. I’ve done some recent development on the concept. I decided to start testing with three areas where sticky care labels could be applied to the badge back. Each of the letters on the badge back corresponds to a type of care label. What kind of behaviour would you like people to have around you. There are six stickers in this group. Assuming the previous two conditions permit it, c stands for ‘chat’ – interests that you might share in common with others. There are twenty of these and I’m not going to list them all here but they range from art & design, to the outdoors and comedy. At this stage in their development, I just wanted to gather some feedback from a small number of people on how Care Labels For Humans worked for them. ThoughtWorks generously hosted us in their brand new home at The Federation. 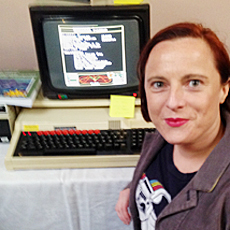 Geek Mental Help Week is a week-long series of articles, blog posts, conversations, podcasts and events across the web about mental health issues, how to help people who suffer, and those who care for us. As the guests arrived I handed them the badge back to pique their curiosity. It was a small group of around 15 people, ideal for talking about mental health. After very brief introduction from me, we encouraged people to select their A, B and C stickers. We did this during a food break so that people had lots of time to choose their care labels and chat to each other. I encouraged our guests to talk about their care labels to each other, and after the break we reconvened to share comments. The discussion afterwards focused a lot how people interacted with each other at large industry events such as conferences. These events can often seem quite cliquey, and there was a suggestion that people often hide behind their technology to avoid the self-consciousness of being alone outside talks and workshops. It was felt that Care Labels For Humans could be particularly helpful in these kind of scenarios. Naturally, the conversation extended to how the Care Labels could be connected to other devices. I shared my thoughts about how the wearable items could be adjusted physically but communicate digitally to produce Care Label signatures which could be embedded in messaging and other social tools. I was delighted with the feedback and insights I had from the group. I can make some immediate changes from the feedback on the clarity of individual care labels. I’m particularly interested in different sequences of Care Labels (other than A, B, C) could work and how I could build flexibility into the concept. There is still lots more testing to do with the Care Labels For Humans. I am particularly delighted that I managed to put together the prototype with a spend of around £30. I have lots of badges or labels left over so I will be looking for different places to test.